IPA – Now Beer This! Single And A Pint pairs a new song/video with a new beer that’s just come out. Brody is back! Actually, she never really went anywhere. The lead singer of the Distillers has had her hands in a variety of projects, both musically and in life. After having two children with her husband Josh Homme of Queens of the Stone Age, Brody Dalle is bringing her solo material to light. Her full-length solo record, Diploid Love comes out later this month, and the first tracks off it kill. The video for “Meet The Foetus/Oh The Joy” is pretty crazy. The first half is an animated trip around the planet lead by a baby riding a glowing green dragon that brings pages of Japanese anime to life. The drum beats resonate like a furious bang on a galvanized trash can. The second half snaps back to a live-action show of Dalle and Shirley Manson on stage, in a JOYful chorus with an echo that repeats in the song and also in the listener’s brain. The two women’s voices are a perfect combo, and harken back to some of my favorite musical moments from the mid-90s. I picked Otter Creek’s Fresh Slice IPA to go with this song. It’s got the Belgian sweetness that draws you in, but the finish has plenty of bitterness from Cascade, Citra, and Apollo hops. Like this record. It has a lot of pop elements that seem to be far more polished from the snarling days of the Distillers. However, there is definitely the strong foundation of punk rock ethos behind every chord and lyric. Note: you can stream the whole record for free on The Guardian! Check it out! I’m always excited when I can post a review that you can check out live shortly after! Clutch will be playing in New Haven at Toad’s Place this month with Orange Goblin, and you can bet that you’ll hear some gems off their new record, Earth Rocker. I guess touring with Motorhead can do certain things to you. While I can’t say for certain if the guys in Clutch are downing a fifth of Jack Daniels a day, they did put out another fantastic record. Okay. So Earth Rocker is not much unlike Clutch’s other records. But with a band that’s the epitome of maximum rock and roll, consistency isn’t a bad thing. This record sounds especially tight. It was produced by Machine, who has worked with Clutch in the past on 2004’s Blast Tyrant. He’s also worked with artists ranging from Shootyz Groove to Lamb Of God. Title track “Earth Rocker” gets things started, but the second track “Crucial Velocity” really exemplifies what to expect on this record. A chorus hook you can yell along with, and plenty of head-banger-worthy riffs. “DC Sound Attack” takes off with that characteristic-Clutch harmonica and keeps it moving with a pounding beat on the bell of the cymbal. Since this is an analog beer blog after all, I couldn’t agree more. I think this is also the coolest album artwork they’ve had on a record as well. With a futuristic-looking totem, it exemplifies that the band is rocking into the future while maintaining their familiar sound. Clutch and myself both turn 25 this year, and I can only hope that I’ve rocked half as much in my quarter-century of being alive as they have as a band. This is apparently a Beer Camp beer, and although I wasn’t there this year to give it a run for its money, I have to give these campers props. It’s a super solid IPA. It pours a deep black-brown with a fluffy head. I drank it out of a chalice so I think it looked especially nice, although it looks perfectly fine in a shaker pint too. Black IPAs rock because I often find them to be easy drinking while still maintaining a lot of flavor. With an ABV of around 7%, it’s no session ale, but it’s very certainly a very drinkable bang for your buck. Although Clutch does in fact have their own beer, I have not tried it yet. 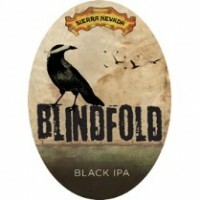 So I’ll be pairing it with Sierra Nevada’s newest IPA, Blindfold. It’s dark and can rock with the most metal of us, but it’s got a sweeter, delicious side too that draws you in like Clutch’s harmonica-driven hooks. If you want a solid IPA, go Sierra Nevada. If you want solid rock and roll, go Clutch. And as Clutch says, “If you’re gonna do it, do it live!” I think so too, and I’ll be at there show on April 16th. Get your tickets at the Toad’s Place box office or online.